Please welcome my contributor Sara as she shares her recipe for Pork Chops with Strawberry Peach Salsa! I’m Sara from Dinner at the Zoo and I’m thrilled to be sharing my recipes with you. Raise your hand if you’ve been grilling this summer! I certainly have, we light up the grill almost every weekend – nothing beats that smoky flavor and as a bonus it doesn’t heat up the house. Today I’m sharing my all time favorite pork chop recipe. My secret is a brine which makes the meat ultra tender and flavorful! 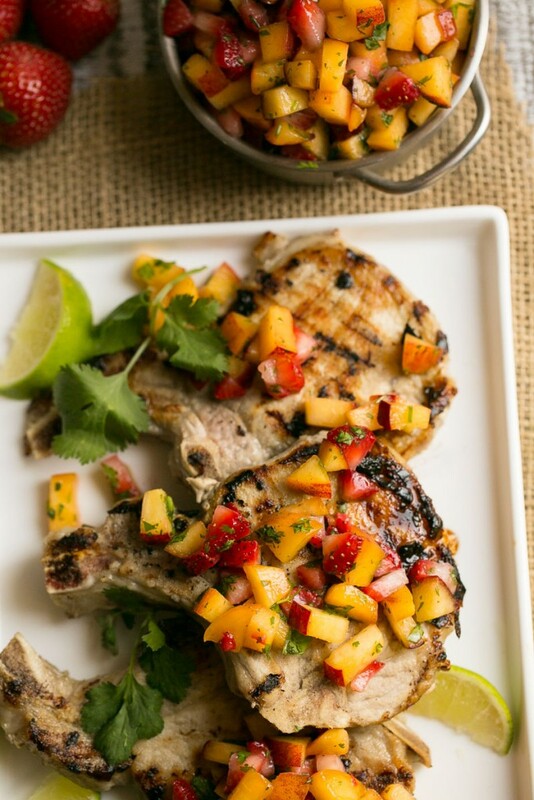 These grilled pork chops with strawberry peach salsa are easy to make and a great way to use all of that amazing fruit that’s in the markets right now. This recipe starts with a brine. If you’ve never made a brine before, don’t be afraid to try it – think of it as a salty marinade. The pork takes on the flavors of the spices in the brine and absorbs just the right amount of salt to properly season the meat. I have made these brined pork chops dozens of times, they’re great on the grill but they can also be cooked on the stove if you don’t have a barbecue. I often serve them plain but today I’ve jazzed things up with a strawberry peach salsa. 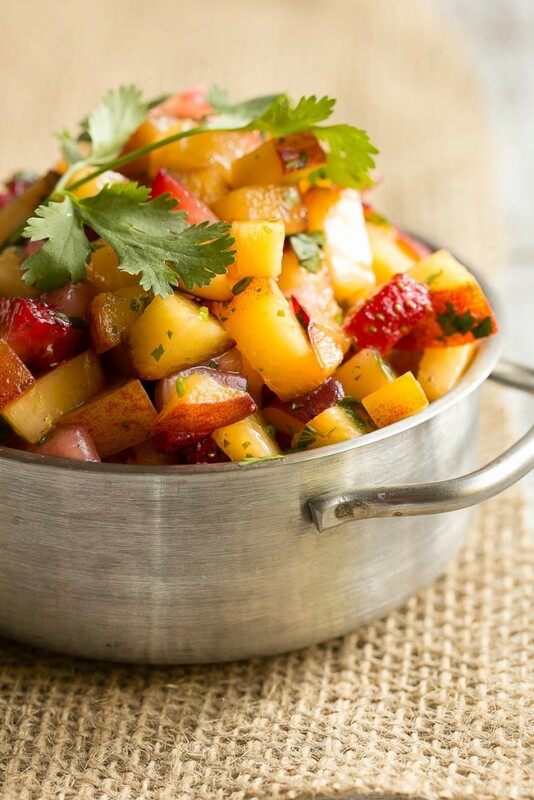 The salsa takes less than 10 minutes to put together – diced peaches and strawberries are mixed with fresh herbs, lime juice and a little seasoning. If you like things spicy you can easily add some minced fresh jalapeno. The nice thing about this recipe is that all of the prep work can be done in advance – the pork comes out of the brine ready to go on the grill and the salsa can be made earlier in the day. 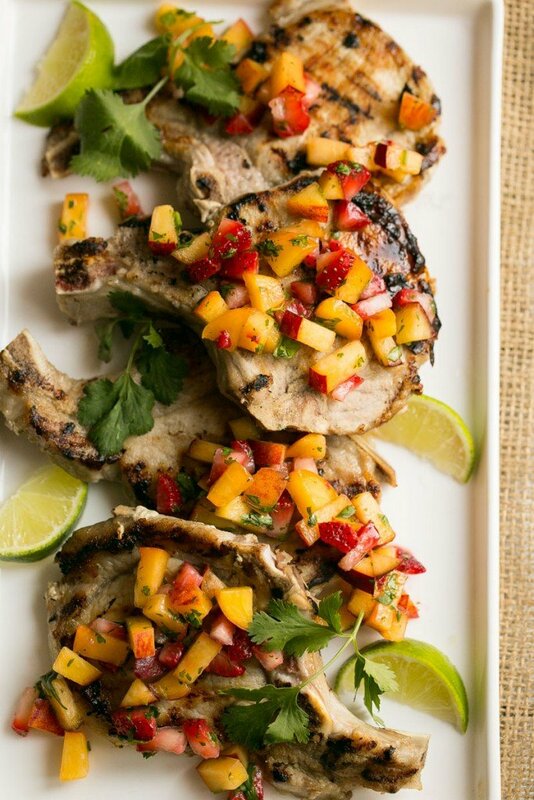 This recipe for grilled pork chops with strawberry mango salsa is a quick and easy meal for a busy weeknight but also looks fancy enough to serve to company. The sweet and tangy salsa is a perfect complement to the savory pork. If you’re new to brining, you’ll be amazed at how it transforms meat without a ton of effort. If you’re hungry for more great recipes, check out my blog Dinner at the Zoo where I share healthy, easy and family friendly meals. You can also find me on Facebook, Pinterest, Instagram, Twitter and Google +. 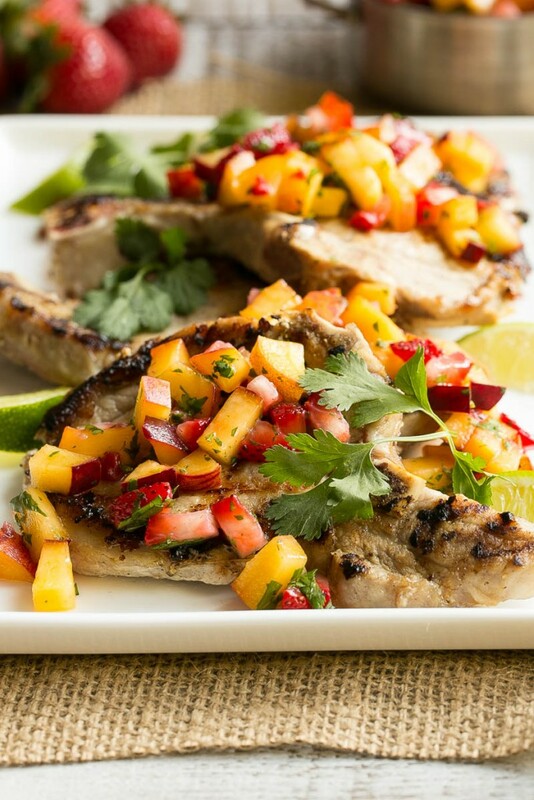 Pork chops that are brined and grilled to perfection, topped with a sweet and tangy strawberry mango salsa. These look amazing! I’m going to have to try them! Pork goes so well with just about any fruit but I especially like the sound of this summery salsa. What a summery fun take on traditional pork chops! I’m a huge strawberry fan, so I can see this happening soon at my house! Fruit goes so well with pork. This combination looks wonderful and the pictures are fabulous. This looks amazing! I love peach salsa on top of it. Looks great for the pork chops. My family would love this for dinners. I’ll have to pick this up at the store this weekend. What a gorgeous photo! Your recipe looks delicious and I have bookmarked this now to make! OMYUM! I just did a pork recipe a few days ago with a mango salsa, but this looks even better! I never would have thought to include strawberries, but I will next time. Thanks so much for sharing this! That looks so scrumptious! I made something similar recently, but with mango! I would have never thought to add strawberries into the mix, but now I can’t wait to give it a go! Thanks for sharing! This is the perfect pork chops recipe for summer! How cool, I’m familiar with Sara’s blog. These look great and I’m excited to try that salsa!